Verified Reviews is a solution to the age-old problem of customers promising to leave your business a review, but never actually doing it. To get around this, our Verified Reviews team will contact your customers on your behalf to collect their feedback. This feedback is then posted on your Thomson Local Business Listing as a Verified Review. This leaves you free to concentrate on doing what you do best, safe in the knowledge that your online reputation is continuing to improve. Customers buy from people they trust, so the more positive reviews you gain, the more likely it is that you’ll achieve your business goals. Gaining honest feedback from your customers is essential to understanding how well you are doing. This feedback could include useful suggestions and easy wins that could have a positive impact on your business. How do Verified Reviews work? You collect an email address or phone number from a customer that’s agreed to leave you some feedback. You pass this information along to the Verified Reviews team using our customer portal (AdCentre), or alternatively via WhatsApp or text message. Our Verified Reviews team will then contact your customer by phone and gather their feedback on your behalf. 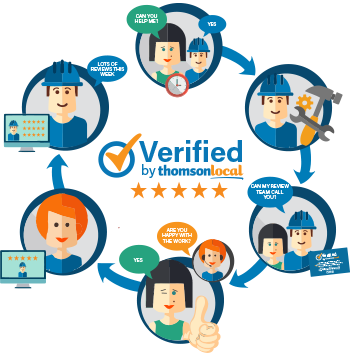 This review is then added to your Thomson Local business listing and marked with a stamp to prove that it’s a Verified Review. You can also display the reviews on your website using the Verified Reviews Widget. What kind of questions do we ask your customers? The Verified Reviews team will ask your customers a variety of questions, each related to a different aspect of their overall experience with your company. What did you hire them to do? Did they leave things clean and tidy? How would you rate them from 1-5? The phone call lasts around 10 minutes and is handled by a member of our UK based Verified Reviews team. So, you can be sure that your company is represented in the best possible light when we call.